What ConvertKit Triggers and Actions are Supported? New Purchase - Triggers when a new purchase is added to your account. New Tag Subscriber - Triggers when a specific tag is added to a subscriber. New Form Subscriber - Triggers when a subscription occurs on a specific form. New Sequence Subscriber - Triggers when a subscriber is added to a sequence. New Subscriber - Triggers when a new subscriber is confirmed within your account (has completed any applicable double opt-ins). New Unsubscribe - Triggers when a subscriber unsubscribes from your emails. Remove Tag From Subscriber - Remove a specific tag from a subscriber if they have it. Add Tag to Subscriber - Add a subscriber to a specific tag. Create or Update Purchase - Adds a purchase to a subscriber, or updates an existing purchase. Add Subscriber to Sequence - Add a subscriber to a specific sequence. Add Subscriber to Form - Subscribe someone to a specific form. 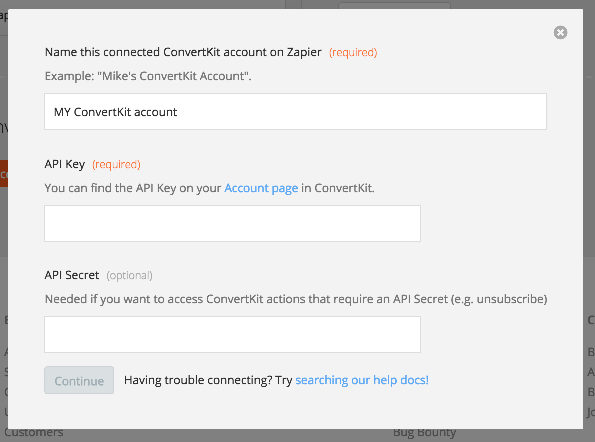 To get started with ConvertKit on Zapier, first you will need to click to connect your ConvertKit account to use with your Zap. Login to your ConvertKit account. Click "Account" from the Top Menu to access your account settings. Copy your API Key to paste into Zapier. 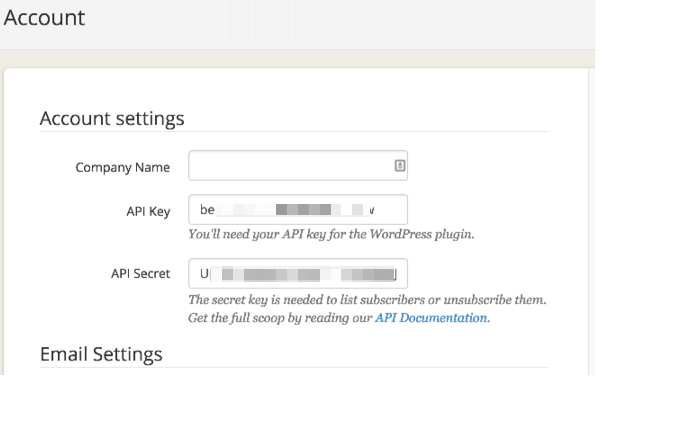 Then click to "show" your API Secret and paste that into Zapier. Once you have pasted those in and click “Continue”. If your API key and secret were entered correctly your ConvertKit account will now be successfully connected. 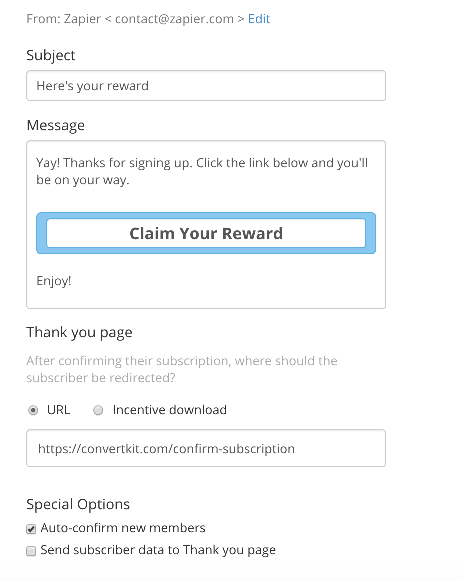 By default, ConvertKit requires that subscribers double opt-in to emails for confirmation. That means they won't show up on the list until they confirm their subscription. If you'd like to automatically add them to the list, you can turn off the double opt-in by going to the Form settings, then clicking Incentive Email, and selecting "auto-confirm new members" at the bottom. If you add subscribers manually in ConvertKit, via the "Import Subscribers" button, the automation triggers (including Zaps) are not triggered. To trigger the Zap, add subscribers through a form or landing page, or through a Zap or the ConvertKit API.